2013 Top Producers with Preferred Care at Home founders Frank and Jody Guerrieri. 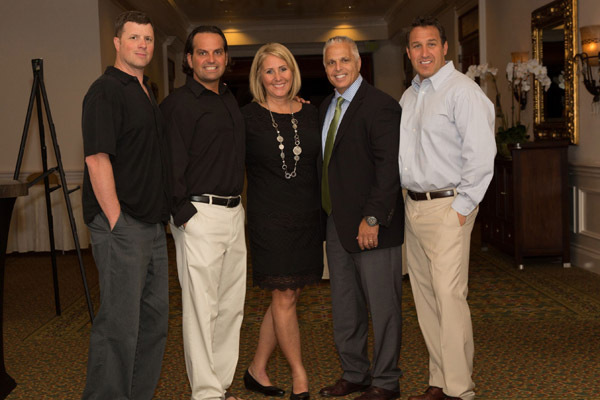 From left to right: Jason Groth, Mike Barnhard, Jody Guerrieri, Frank Guerrieri, and Bob Mlynarek. DELRAY BEACH, FLA., May 13, 2014 – Preferred Care at Home’s annual convention was held on April 29-May 1 at the beach side Marriott in sunny Delray Beach. The theme “Up, Up & Away: The Sky’s the Limit”, perfectly captured the goal of the convention: to celebrate the impact Preferred Care at Home owners have in their communities and to encourage them to greater heights. Franchise owners received up-to-date information on labor laws and client contracts from Attorney Bob E. King, who has practiced labor and employment law in Orange County, California, for 15 years. He works with home care agencies nationwide advising on employment law, contracts and more. Yet, perhaps the most beneficial part of the conference was hearing from other franchise owners as they spoke on how they have grown their business. From referral marketing and direct mail campaigns to office structure and financial planning, franchise owners spoke from personal experience and shared powerful stories. Nineteen home-care franchises from across the country received the Presidential Awards. The states with honored offices include: Alabama, Alaska, California, Colorado, Florida, Kansas, Louisiana, Michigan, New Jersey, Ohio, Tennessee and Texas. Jason Groth, Mike Barnhard, and Bob Mlynarek, owners of Preferred Care at Home of Macomb County, Michigan, earned the highest honor as Preferred Care at Home’s “Top Producer.” These three firefighters are known in their community for their exceptional care of both the clients and caregivers. Whether changing a flat tire for a caregiver in Detroit or preforming a home safety check for their senior clients, their spirit of service is what sets them apart. Preferred Care at Home of Northwest Louisiana, owners Scott Green and Robert Smith, received “Rookie of the Year” Award for 2013. Green and Smith were the highest grossing Rookie of the Year since the founding of Preferred Care at Home. The following awards were given for meeting mile markers for top production and service during 2013. Since 1984, the founders of Preferred Care at Home have been dedicated to providing reliable, compassionate and affordable home care. This care improves quality of life while safeguarding independence and dignity. Services include companionship, meal preparation, hygiene assistance, medication reminders, transportation and more. Preferred Care at Home is a nationally franchised company with headquarters in Delray Beach, Florida.